The term Google Adwords results in either regret or delight depending on which Marketing Company you've entrusted in the past. We're not just another marketer. Google Adwords take up literally 60% of the screen on desktop and 100% on mobile. 60% of searches are now done on mobile devices. The landing pages we design are especially designed for ease of use on a Smart Phone. Unlike the marketing team handling Dr. Worthington's adwords campaign we make sure to setup our campaigns to people that actually live nearby. Google has my location as Brookfield, CT, but Dr. Worthington is wasting about $5 per click because his office is located in Fairfield, CT. Fairfield just so happens to be about an hour from Brookfield. People will travel for Dental Implants, Invisalign, TMJ, and certain type of Cosmetic Dentistry, but only because of a very persuasive landing page and a high click through rate. Needless to say, our friend Dr. Worthington is going to be joining the majority of dentists in the regret category. 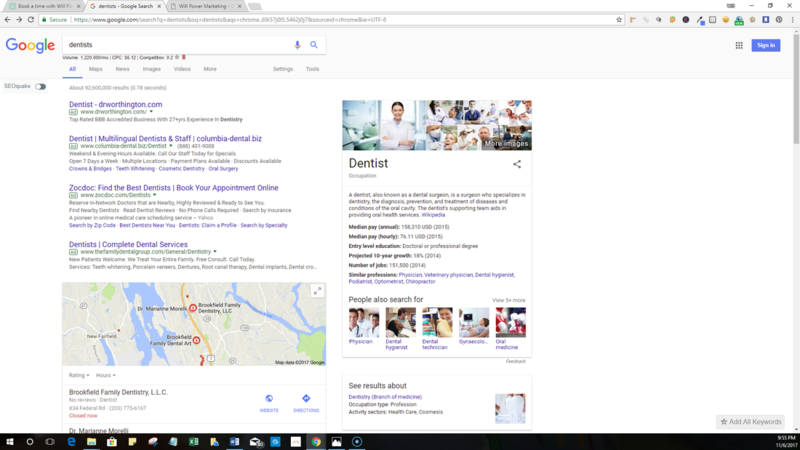 Our Google Ads are setup to match exactly what your prospect is searching for and display a convincing offer. Our experts will use the exact language and writing style to engage with your perfect customer. Track everything... Ever notice that when you click on an ad you then see it everywhere? We do that. If you have the WILL grow your business we have the WAY to transform you into the top expert in your city.